The Hold-Right® Wall Anchor System has helped thousands of homeowners straighten and stabilize their bowing, bulging, and tipping basement walls. The Hold-Right® Wall Anchor System is made from quality steel and is galvanized for a long life-span, with the assurance of being able to perform well in a variety of soil conditions. The Hold-Right® Wall Anchors have been uniquely engineered so they are able to straighten the foundation wall immediately when the excavation of the soil is performed on the outside of the foundation. Hold-Right® Wall Anchors are also able to straighten foundation walls over time with minimal disruption to your yard and landscaping. The Hold-Right® Wall Anchors are a proven anchor system to secure and stabilize basement foundations. Hold-Right® Wall Anchors are Engineer Certified! Anchors have been around for over 70 years demonstrating tremendous holding power. Some examples are utility poles, guard rails, oil derrick rigs, etc. 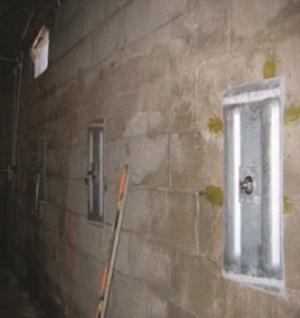 The Hold-Right® Wall Anchor System demands quality – therefore the materials are made of high-quality steel and galvanized for preservation and will perform well in a variety of soil conditions, pulling the buckling, bulging or bowing basement walls back towards plumb. Hold-Right® Wall Anchors are Engineer Certified. The anchors have been stress tested far beyond normal use and performed well beyond expectations. The Hold-Right® Wall Anchor System is unique in that our anchors can actually straighten bulging and buckling walls even if the bowed wall is pulled off the building wall plate. Hold-Right® Wall Anchors can also be used to anchor stabilize a retaining wall and any kind of concrete wall pits.